In my last article I touched on how what we put on our skin affects our health. Hard for some people to believe. Today we’ll look at the more accepted premise – we are what we eat. Think about it. We consume “stuff” and it becomes our bodies. Shouldn’t we be aware of what is in that “stuff”? What we put in our mouth is the #1 contributor to our wellness (or lack thereof). The way we eat changes our immune system, our muscles and joints, our brain and moods. With the degradation of the food supply, our wellness is running into major trouble. So let’s take a look at pesticides. Organophophate pesticide poisons were developed during Hitler’s reign as chemical warfare. And we’re using them on our crops?? There are over 180 identified pesticides used in this country that are endocrine disruptors. That means they mess with our hormones (like insulin) which oversee the functioning of all the necessary activities in the body. The average American consumer is exposed to between 5 and 10 pesticides per day on the Standard American Diet (SAD) . Even with a well functioning liver, those toxins are going to build up. Proponents of the chemical industry say the trace amounts in our food are too small to negatively effect health (100 parts per billion). Did you know that the NuvaRing, the birth control vaginal ring, contains .019 parts per billion and it prevents reproduction?! Albuterol, the asthma inhaler, works at 2.1 parts per billion, quite effectively for those in distress. We’re kidding ourselves if we think the pesticide residues in and on our food are inert. 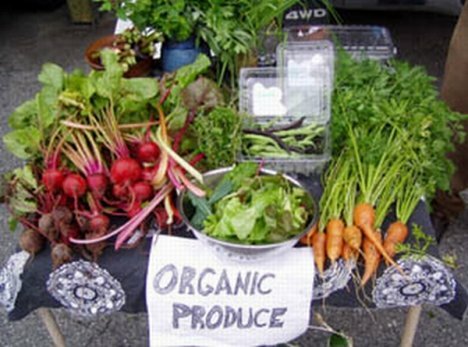 Why aren’t physicians advising everyone to eat organic? Because they are not being educated about the damaging, even life threatening effects of pesticides on living cells/tissues/bodies. They’re treating diseases AFTER they occur. The information is out there, but it has not been considered a priority in med school. Who is going to advocate for including it in the curriculum? Consider this. Back in the 80’s when I was raising my family, kids just didn’t have the health problems they’re having today. It was rare to see a child or adolescent with high blood sugar or blood pressure, abnormal cholesterol or triglycerides, or a waist size above 40 inches. Now, 2/3 of high school students have at least one of these markers (Dr. Alan Greene, lecture to organic farmers, 2009). During the last 30 years our food supply has experienced MAJOR compromises (pesticides, GMO’s, high fructose corn syrup, additives, preservatives, colorings, and more). The way we are feeding our children is setting them up for a lifetime (often abbreviated) of illness. So let’s talk about diabetes for a minute. Studies have confirmed a link between diabetes prevalence (and auto-immune diseases) and pesticides. Adult onset diabetes is now called type II diabetes because so many young people are getting it. A diagnosis of diabetes for a child is likely to reduce their lifespan 10-20 years. The cost of caring for them over their lifetime is estimated somewhere between $300,000 and $3 million – per child! Why then, do we continue sourcing our school lunches from conventionally grown and processed foods? Because it’s cheap, “inexpensive” if you will. We can feed a lot of children for very little money. The long term price tag however, is astronomical. And the pain and sadness are priceless. Imagine what we could do if we spent more for organic food and prevented diabetes in thousands (and thousands) of young people. OK, so pesticides are dangerous. What about the hormones they use to fatten up livestock, make more milk and get those huge chicken breasts we think are good for us? Well, there is NO evidence anywhere to show the safety of the hormones used on animals. There are studies however, that show increased cancer in people who consume conventionally raised meat. That was why in 1989, Europe banned the import of meat raised in this country. The great thing is, there are farmers with integrity out there that understand the connection between sustainable farming and sustaining human life. Animals raised on smaller farms are roaming the grass in the sunshine and taking in life sustaining nutrients that are passed on to us when we eat them. Organic vegetable and fruit farmers do not use toxic, cancer causing pesticides, AND they add needed minerals back into the soil so plants and trees can bear produce that builds healthy human bodies. Research shows that organically grown foods contain significantly more nutrients and antioxidants AND those nutrients are more bioavailable to your cells. Anyone who consumes organically raised food on a regular basis also knows it tastes great! I encourage you to find local sources for organically raised food. There are more and more every day as we spread the word of true healthy living. Until next time…Wishing you real food for real health so you can be REAL HAPPY. Serum organochlorine pesticide residues and risk of gallstone disease: A case-control study in Xiamen. 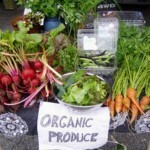 Organic Foods Contain More Nutrients!